A Must See Movie - I went to see this last night... it was one of the best things Ive ever seen. So many things people just don't know...and you find out...from her family. What happened to her early on... Bobby Brown is not the bad guy made out to be...Although he is a control freak. Her Lesbian Lover Robin's huge influence...her Tragic childhood. Again , its all about your childhood. The GREATEST VOICE IN THE PLANET > Whitney Houston will forever be the ultimate Voice. Perfect pitch, tone, resonance, emotive ability and control. Singing history is defined as Before Whitney and After Whitney...? note: Should continue to play in the Theaters. Many people did not know this is on. Wow! 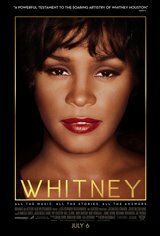 It was great to see Whitney's talent but sad to see the decline of this talented vocalist. Riveting! An amazing and must see documentary. Very open and candid dialogue. Actual cast definitely a plus.